Kenyans love laws. The unmistakable belief that a law will make certain undesirable habits change because of the consequences of breaking such laws is common here. It is however lost on these Kenyans that even they themselves break many laws, with abandon. Therefore, new laws will not make people change their habits for the better, but will instead make people adopt their behaviour to account for the law, hence creating some other unintended consequence most of the time. Take, for example, the laws that regulate the price of oil - petrol and diesel - in Kenya. 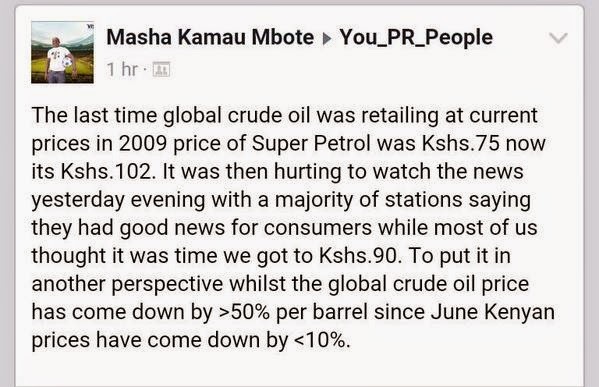 A few years ago, at some point, politicians felt that the price of oil in Kenya was too high on fumes, and that the citizen was being "exploited" by oil companies. The politicians even went ahead and decided that it was not only the oil companies that were fleecing Kenyans, but many other manufacturers were also selling their items at too high a price for the "mwananchi". The mananchi, for strange reasons, is always stuck in poverty and appears to struggle to afford most needs. For some reason, it did not hit the politician's minds that all these prices they were complaining about, all existed in a free market. Sellers were free to set their own prices and buyers were free to buy at prices they felt deserving. If prices were high across the board, and people were still buying, then probably it had nothing to do with the sellers. But then, there's what I call the carpenter's problem. A carpenter will tend to assume that most problems, including those not involving pieces of timber, can be solved by hammering at them. We all do it, starting from when we are children and all problems are solved by a well of tears. Equivalently, a Member of Parliament makes laws, and tends to think that all problems can somehow be solved by making laws that address the problem. So Kenya's parliament tried to address the problem of high prices by threatening to make laws that would set low prices, for the mwananchi. This leads us to problem #2. Kenyans do not read, or research their problems. Going to school to get a certificate that makes us more competitive in jobs, is often mistaken for reading and knowledge. It thus escaped these MPs that price control laws have a long history of never working, be it in Russia, or the United States of America. The MPs thus passed a law that regulated the price of oil, and appeared to work for the Mwananchi just after it was passed. However, the price did not reduce as much, and remained around KSh. 110, which was where the global prices were. Fast forward to 2014 where global prices, almost halved, dropping by about 40 percent. Back in Kenya, prices have remained above KSh. 100, with excuses being given as to why Kenyans are not enjoying oil at between KSh. 60 to a maximum KSh. 90. One hilarious excuse was that oil Kenyan imports is a special kind of oil. As the overzealous MPs had been warned before, price regulation does not work. Their intent to control oil prices now mean that Kenyans pay some of the highest prices for oil in the world. A catastrophic failure for using the wrong tool for the wrong job. It would have been better to increase competition by encouraging new oil market players, rather than by controlling prices. is thus to grow the economy as shown here. Culprit number 2 is the Government of Kenya (GoK), same culprit as above, but a different arm of it. Always after higher taxes, GoK decided that alcohol is a good target, since people will always drink, and alcohol is seen as a societal evil, which needs to be punished kidogo. GoK thus decided to tax keg, a popular alcohol packed in large "kegs", dispensed into jugs, and that retailed at between KSh. 25 to Ksh. 30. By increasing tax on the popular drink, GoK would quickly raise, even double or triple taxes collected from these evil drinkers, which would go to development. Wrong. With Keg prices up to KSh. 60, the target market could no longer afford the drink. They instead went back to drinking illicit changaa ,for which taxes are not paid, and which sometimes leads to death due to use of wrong ingredients. attempt to increase taxes failed. The market for Keg disappeared overnight, and the manufacturer ceased producing the drink due to low demand. The result? Instead of doubling taxes collected, GoK collected nothing, and the few taxes which were being collected from the brewer, were lost. Jobs contributing to the economy were also lost. 20,000 sorghum farmers were left looking for an alternate source of income. Yet another, catastrophic move from the Government of Kenya. What is even more of a catastrophe, is not my overuse of catastrophe, but that Kenyans still anticipate new laws will solve their problems, and demand a law for every problem.